Just go see it. Before you read this, before you pollute your brain with the wonderful twists and turns that this tale will bring you, go watch “La La Land.” Watch it and come back and read this and argue with me, because I’m sure that many of you will disagree. First and foremost, see it for the beautiful, old-fashioned style. Embrace the big musical numbers with splashes of vibrant color that contrast and complement each other. Let the romantic montages and piano-based songs envelop you. The music, while not especially memorable or unique, is addicting and fun–I’m still listening to the soundtrack day and night and enjoying every second of it. Even if you don’t want to analyze every second, see it for the sake of pure enjoyment. Putting aside any examination of the film’s plot or visual style, it’s still a fantastic feel-good movie. “I walked out of the theater really happy,” Finn Collom ’20 summarized. What’s more, the emotional weight of the film cannot be underestimated. “[It’s] a smack over a head when you realize that the guy she’s kissing isn’t him…” commented Nikhil Ghosh ’20. 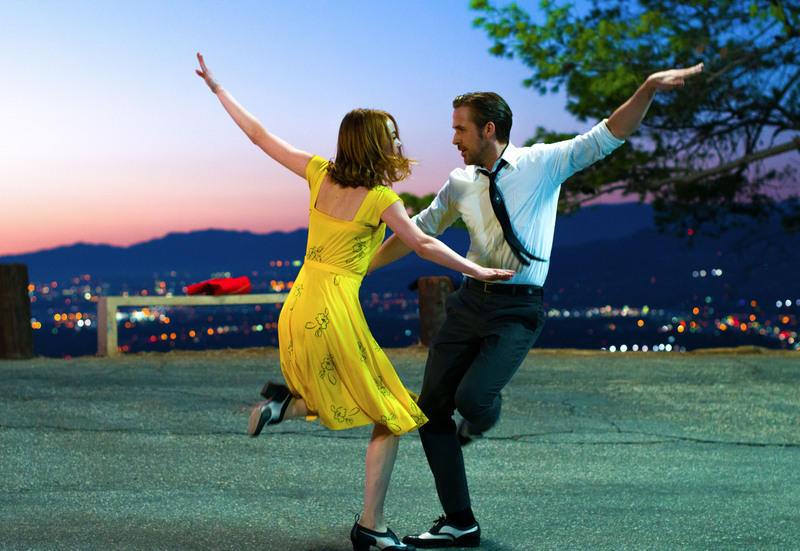 “La La Land,” directed by Damien Chazelle, stars Ryan Gosling and Emma Stone as two determined, artistically-driven individuals. Mia (Stone) wants to be an actress and Sebastian (Gosling) wants to open his own jazz club. They meet in an awkward and quirky way and inevitably fall in love. The opening line of Avril Lavigne’s “Sk8er Boi” acts as adequate plot summary. “He was a boy / She was a girl / Can I make it any more obvious?” Lavigne unintentionally foreshadows. The film itself is faced with a struggle similar to that which Sebastian’s character faces: modernizing and innovating to maintain the audience’s interest while keeping a strong, clear link to the traditional roots of the genre. Sebastian romantically clings to traditional jazz while the film itself clings style-wise to 1950s movies, highlighting bright colors, dramatic lighting, and camera angles. However, unlike Sebastian, the film ends up betraying its own genre, and I believe that it’s for the better. The first and most pivotal indication of this betrayal is Mia’s big audition scene. When she arrives, rather than deliver a prepared scene or monologue, she’s asked to simply tell the casting agents a story. My rom-com-oriented brain was tingling: She was going to tell the story of a man that honked his horn at her in morning L.A. traffic, she’d flipped him off, and then the two of them had dated for a year. But no. She tells a story about her aunt, who inspired her to enter the theater world. At that moment, it all clicked for me. “La La Land” is not a love story. It was never about the two heroes ending up together. This is the story of two extraordinarily passionate and determined individuals. Two dreamers who, unlike so many, actually achieve their dreams. In the end, Mia and Sebastian live happily ever after, but not together. Of course, we all want the two gorgeous main characters to get married and have a family, but, even in the final fantasy scene where they continue their relationship, it’s still an imperfect world. Sebastian never achieves his dream of opening his own club. The two of them were so good for each other because they pushed each other towards their own passions–and in doing so, each also pushed the other away. In fact, it would seem that Mia and Sebastian are deeply and romantically in love, but with their professions as opposed to each other. One night, Sebastian comes back from tour to surprise Mia. She brings up his work with his new band because she thinks that he would be happier playing traditional jazz. They fight and he reveals his insecurities about opening his own club because people might not come. Mia then tries to reassure him by saying that people are drawn to those that remind them of their own passions and, due to his strong passion for jazz, people will thus be drawn to his club. This is the singular idea that sums up their relationship. It’s exciting and rare for both of them to find someone as inspired as themselves. They revel in each other’s hunger for their art, but, of course, such singularly-minded people cannot maintain a serious, committed relationship. They were willing to make the hard choices to preserve and prioritize their careers over each other: When either of them choose the other over their art, they are both unhappy. The surrealism of the film (which appears most vividly in a planetarium scene) occasionally takes away from the storyline, although the filmmakers were clearly trying to pay homage to older films of the genre. The film also deviates from realism in the plot line, given that the two end up extremely successful in their fields. The film’s lack of a diverse cast is also a legitimate criticism that should detract from its popularity. Despite its imperfections, however, the film’s technical mastery and clear call back to 1950s films makes it an extremely fun viewing experience. They are romantics. They are artists. They are dreamers. And, yes, for a little while, they need each other. He pushed her to create roles for herself and explore new depths of her abilities in acting and writing, while she pushed him to follow his specific passion for pure jazz. But, in the end, they needed to fulfill their individual goals more than they ever needed each other. They were drawn to each other for their similarities and those very similarities are exactly what drove them apart. Mia and Sebastian’s respective lives are my own kind of happy ending: to know what you love, pursue it, and reach it, despite the numerous obstacles and temptations that come across your path. In film, romantic relationships often fall into place. The same cannot be said for professional achievement, which is usually portrayed as reliant on luck, in addition to a significant amount of hard work. Seeing their struggles, failures, and eventual success is inspiring. Some choose to believe that Mia’s relationship at the end of the film is an unhappy one because they are not as overwhelmingly adoring as Mia and Seb were; however, the lack of obvious passion between Mia and her long-term partner, Greg (Finn Wittrock) does not necessarily indicate an inferior relationship. If anything, see “La La Land” to participate in the conversation. Whether you think they should have ended up together, or that they rightfully sacrificed their relationship for the good of their individual careers, or that the film’s lack of diversity (in any sense of the word) trumps its praiseworthy qualities, at the very least, I can say that it’s worth your time.